You know the books you’d like to read one day, but they always seem to be low enough on the reading priority list that you never really get around to reading them? 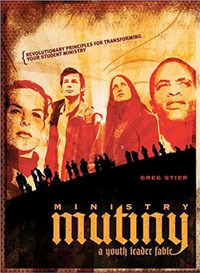 “Ministry Mutiny: A Youth Leader Fable,” by Greg Stier was on that stack for me for about two years. But as I become more and more passionate about Deep & Wide and how that works in my youth ministry, I pulled it out and, Wow! Why did I wait so long to read this?! I picked up 10 copies of it and had all my adult youth workers pass the copies around to each other throughout the summer until almost everyone read it. Now I’m blogging about this book because you need to read it, too. In fact, every youth worker needs to read this book. From a narrative perspective, the story line isn’t the most gripping one you’ll ever read. I can easily identify with the young youth leader who’s frustrated with youth ministry and is about to resign, but the veteran youth worker who comes to the rescue and mentors the young man for a week seems a bit too perfect to be believable. Nonetheless, it’s not the narrative that’s intended to keep you moving through the chapters as much as it is the advice, wisdom, and practical ideas that flow from the mentor in the story. Through the mentor, Greg challenges the typical paradigm of youth ministry on all levels. Everything from curriculum, how we teach, youth events, outreach, spiritual growth, relevance, teen drop-out from church, the role of parents, and everything in between. He explains everything you always felt was somehow not quite right, but weren’t quite sure why. But he doesn’t just point out the ineffectiveness and dangers of a typical approach to youth ministry — he builds a picture straight from the pages of scripture of what youth ministry should look like, what we all deep down inside really want it to be in the first place, but never articulated as clearly as Greg does. There’s two things I especially love about the “mutiny from typical ministry” in this book. First, Greg focuses on exactly what I’ve always held to be true: Who we are in ministry should always determine what we do in ministry, never vice versa. As Ephesians so clearly states, identity “in Christ” comes first, function flows from that. And second, he doesn’t break down the youth ministry system without giving practical, down-to-earth ideas for how to implement the proposed ideas and changes in our youth groups. It’s as much a book of ideas as it is anything else. At only 158 pages long, it’s a quick read, but, like I did, you’ll still find yourself highlighting and underlining many pages as you evaluate your own ministry in light of the wisdom Greg imparts from scripture. Read this book, even if you have to raid the vending machine at church to scrape together the $10 for it.